With about 4 inches of snow on the ground already from our current storm and another 2 to 4 predicted during the day, it seems a good time to consider the pros and cons of a delayed spring. For those not from Minnesota, since the beginning of 2018, we have had two days (yes, just two) with a high temperature of 50 degrees or higher in the Twin Cities. Both of those days were in March—and neither of them topped 55. Currently, we are in a broken record of 30-degree days with nights in the 20s interrupted only by intermittent snowstorms. Some weather forecasters have said this will last into mid-April. Others say we get a break next week. (I hope these guys are right.) So what happens in the garden when spring takes forever to arrive? Less chance of freeze damaging fruit crops. Back in 2012, we had an extremely early spring, with my cherry tree (and lots of apple trees) blooming in early April—about four weeks ahead of usual. When the inevitable frost came, many fruit crops were severely damaged. That won’t happen this year. Adequate soil moisture. This year, Minnesota has had an average amount of snow or a bit higher. Since there has been some thawing of the ground, these late season snows should give us decent soil moisture going into the planting season. I’m sure there are some other benefits to a slow spring, but there are plenty of cons, too. 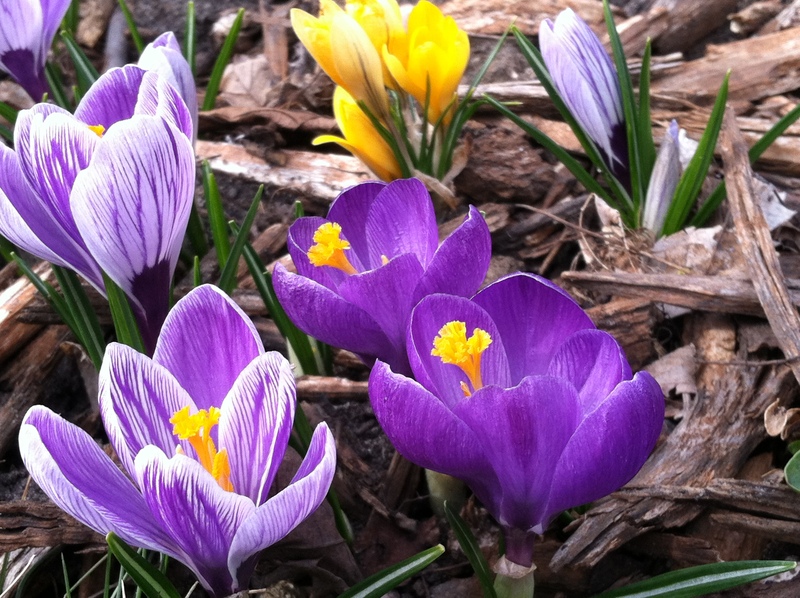 In 2015, crocus were blooming in my yard on March 31. In 2016, they were blooming on March 15. This year, nothing but snow so far. When things bloom, it will be a bloom explosion! When spring comes on gently and slowly as it did last year, blooms emerge gradually in a steady parade of color from the yellows of forsythia to creamy magnolias, pink rhododendrons, redbuds, fruit trees and lilacs. Bulbs do the same. In the best of years, this unfolding of color can start in late March. A delayed spring means everything rushes to bloom at once—boom. It’s marvelous when it happens, but wow, it doesn’t last long. And, for people with allergies, all that blooming means lots of types of pollen all at once. On the upside, the pollen count in my neighborhood today is zero! A pansy pile up at the local garden centers! I visited a couple of garden centers during a slightly warm day 10 days ago, and the pansy bowls were piled up in the greenhouses. 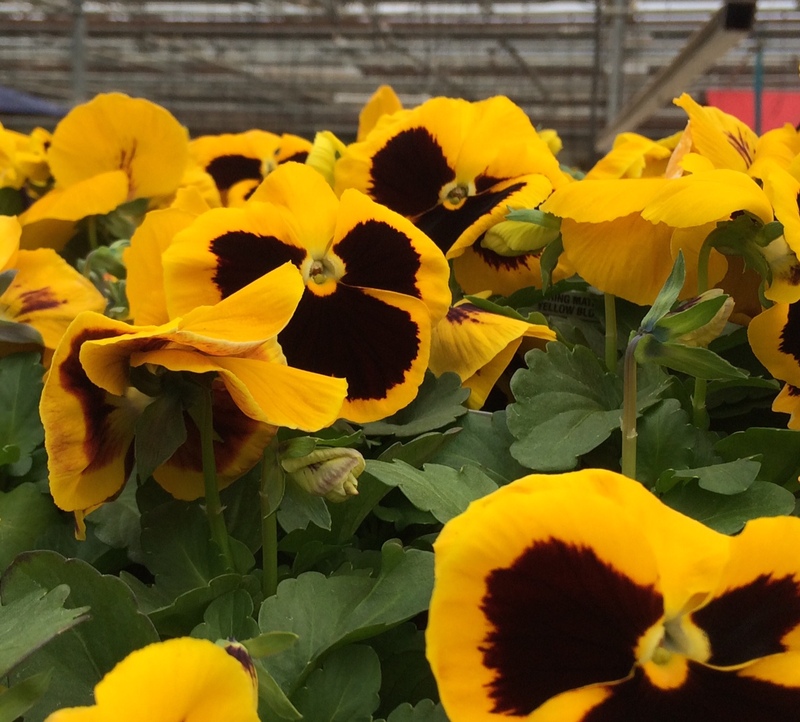 While pansies can tolerate temps down to 26, it’s best not to put them outdoors fulltime until nighttime temperatures are reliably in the 40s. So, hold off for at least a week. After that, rush to your local garden center, because you will be starved for color! I wrote a profile of this DIY greenhouse for the November/December 2017 issue of Northern Gardener. 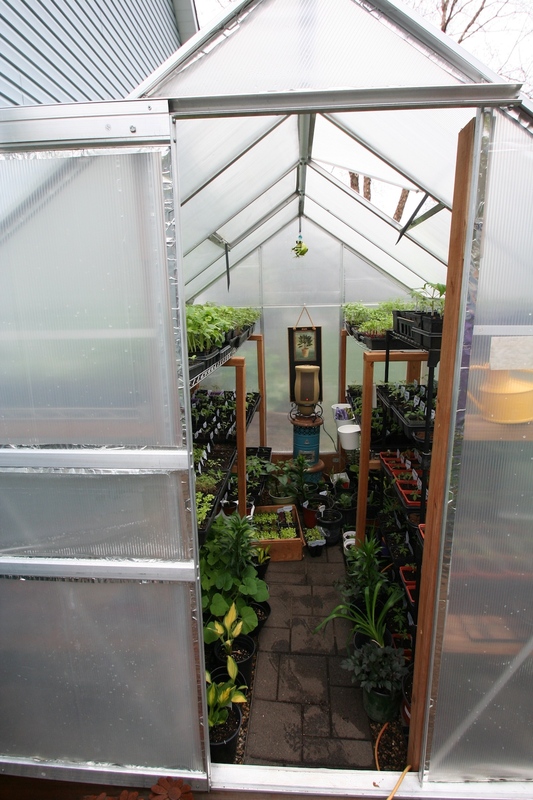 This would be a great year to have a greenhouse! A slow start in the vegetable garden. This would be a great year to have a greenhouse, because it’s going to be awhile before the soil temperature is warm enough to plant even cool-season crops such as lettuce and peas. Seeds for vegetables such as radishes and lettuce will germinate at soil temperatures as low as 40 degrees, but it takes a lot longer to germinate at 40 than it does at 50 or 60 degrees. So, fire up those indoor light systems and give your vegetables a head start inside. Just for perspective, the soil temperature in my raised beds right now is 35 degrees. We’ve got a way to go. Hungry birds. I haven’t seen any robins yet though they could be around, but I have definitely noticed more birdsong in the morning. If you garden for birds, keep the feeders full and put out some water for them. It will be awhile before they can nibble on insects in the garden. Speaking of insects, a long winter is unlikely to affect populations of Japanese beetles, emerald ash borers and other insects gardeners consider pests. Bummer. Mary – I love your optimism! The other con of a late spring is that I’m planting way to many seeds indoors. It was nice to meet you last week at the garden photography class. Happy gardening (or dreaming about it). I’m realllly trying to be optimstic! Thanks for saying hi at Michelle’s talk — it was good to meet you too, Joanna. There are always pros (and cons). 😉 Here in S. Wisconsin, we’ve had inadequate snow cover this winter. The pros: We haven’t had to shovel much, and perhaps (just perhaps) the lack of snow insulation may have killed off a few Japanese beetle grubs. The cons: Inadequate snow insulation when temps were really cold in January may have killed off some perennials (we shall see). Also, we are drier than “normal,” although rain (and snow) are in the forecast several times in the 10-day forecast. I’m hoping for your more optimistic view of a warm-up, too. Come on spring! I wanted you to know the Robins have been around for a couple of weeks in East Bethel. Thank you for the wonderful article! That’s good to know! A friend in Minneapolis tells me they are there, too, in abundance. electicity was off most of the day…… promised 16° tonite…..
all our berries and most of our apples……. Oh, BTW these intermittent storms have names here…. ie Robin snow, Sarvis snow, Easter snow etc….. But once Spring arrives it is like Heaven!!!!! We have many birds etc… Thanks for the opportunity to comment……. We don’t usually name storms in the Midwest — I think that comes from hurricanes, which is the one bad weather event we never have! Here’s hoping for a warm and lovely spring! At this time of the year it can be hard to feel optimistic. My cheerful golden crocus are swooning and ready to give up. Still I look forward to May in Austin and seeing you again. Yes, you folks on the East Coast have had a rough winter, too. I am also really ready for Austin! Looking forward to catching up!